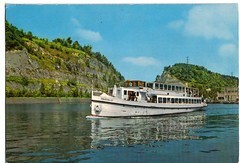 Tour boat “Maasvallei” on the River Maas (Meuse) in the North East of Belgium. A Postcrossing Post Card from Theo who lives in Lommel, Belgium. I love those stamps too.